Italian, rabbi and scholar; born at Reggio nell' Emilia about 1750: died March 28, 1834. He studied under Sansone Naḥmani and Isaiah Vita Carmi. He established in his native city a school that produced several rabbis, among whom D. J. Maroni deserves special mention. Coen preached not only at Reggio nell' Emilia, but also in the neighboring communities. 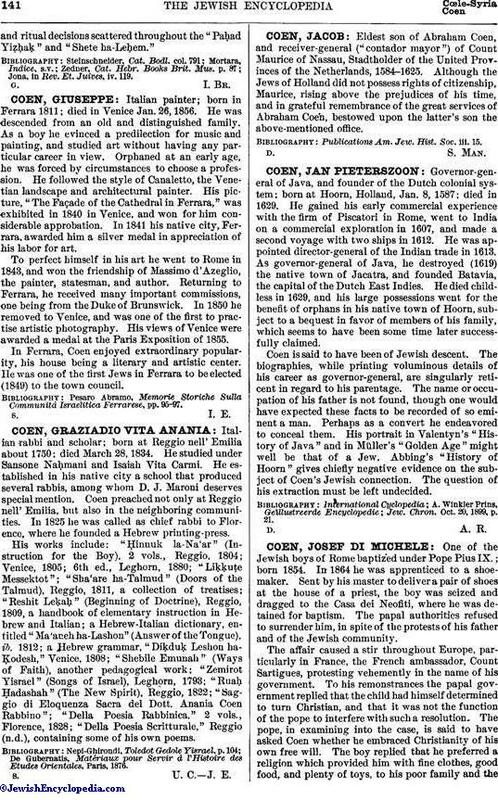 In 1825 he was called as chief rabbi to Florence, where he founded a Hebrew printing-press. His works include: "Ḥinnuk la-Na'ar" (Instruction for the Boy), 2 vols., Reggio, 1804; Venice, 1805; 6th ed., Leghorn, 1880; "Liḳḳuṭe Messektot"; "Sha'are ha-Talmud" (Doors of the Talmud), Reggio, 1811, a collection of treatises; "Reshit Leḳaḥ" (Beginning of Doctrine), Reggio, 1809, a handbook of elementary instruction in Hebrew and Italian; a Hebrew-Italian dictionary, entitled "Ma'aneh ha-Lashon" (Answer of the Tongue), ib. 1812; a Hebrew grammar, "Diḳduḳ Leshon ha-Ḳodesh," Venice, 1808; "Shebile Emunah" (Ways of Faith), another pedagogical work; "Zemirot Yisrael" (Songs of Israel), Leghorn, 1793; "Ruaḥ Ḥadashah" (The New Spirit), Reggio, 1822; "Saggio di Eloquenza Sacra del Dott. Anania Coen Rabbino"; "Della Poesia Rabbinica," 2 vols., Florence, 1828; "Della Poesia Scritturale," Reggio (n.d.), containing some of his own poems. De Gubernatis, Matriaux pour Servir à VHistoire des Etudes Orientales, Paris, 1876. S. U. C. J. E.